The Yakovlev Yak-28 was a swept wing, turbojet-powered combat aircraft used by the Soviet Union. Produced initially as a bomber, it was also manufactured in reconnaissance, electronic warfare, interceptor, and trainer versions, known by the NATO reporting names Brewer, Firebar, and Maestro respectively. Based on The Yak-129 prototype first flown on 5 March 1958, it began to enter service in 1960. It was first seen by the West at the Tushino air show on May Day 1961. Western analysts initially believed it to be a fighter rather than an attack aircraft - and a continuation of the Yak-25M, at that - and it was designated 'Flashlight'. After its actual role was realized, the Yak-28 bomber series was redesignated "Brewer". Total production of all Yak-28s was 1,180. The Yak-28P was withdrawn in the early 1980s, but trainer and other versions soldiered on until after the fall of the Soviet Union, flying until at least 1992. The recce and ECM aircraft were eventually replaced by variants of the Sukhoi Su-24. The Yak-28 had a large mid-mounted wing, swept at 45 degrees. The tailplane set halfway up the vertical fin (with cut-outs to allow rudder movement). Slotted flaps are mounted on the leading edges of the wings. The two Tumansky R-11 turbojet engines, initially with 57 kN (12,795 lbf) thrust each, are mounted in pods, similar to the previous Yak-25. The wing-mounted engines and bicycle-type main landing gear (supplemented by outrigger wheels in fairings near the wingtips) are widely spaced, allowing most of the fuselage to be used for fuel and equipment. It was primarily transonic, although Mach 1 could be exceeded at high altitude. Tactical bomber initial production version built in small numbers without radar. Production of Yak-28 with weapon-aiming radar fitted, and various improvements such as fittings for JATO bottles. Tactical bomber with ground controlled targeting system using triangulation from ground based transmitter sites. Tactical bomber with the internal targeting system "Initiativa-2" 360-degree ground mapping radar. A single Yak-28 converted for testing short take-off and landing techniques with JATO bottles and braking parachutes. A dedicated tactical reconnaissance version of the Yak-28I, with increased headroom under the pilots canopy, increased nose glazing with a sloping rear bulkhead, Initsiatava-2 radar, and five interchangeable pallets containing various mission equipment fits. Yak-28SR (samolyot raspylitel - spraying/dusting aircraft) first use of SR.
Chemical warfare aircraft for dispensing dust or liquid agents from underwing tank/applicators. Though recommended for production none were delivered to the VVS. Yak-28SR (izdeliye 28SR) second use of SR.
Tactical reconnaissance aircraft fitted with an active radio/radar jammer (either SPS-141 or SPS-143). Production was on a very small scale. Television reconnaissance system to send real-time images to a ground base. Back-up provided by a 190mm focal length still camerea. Radiation intelligence aircraft with RR8311-100 air sampling pods, for gathering samples of nuclear tests. 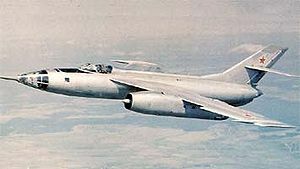 The pods were specially designed for the Yak-28RR but became standard fit for all subsequent radiation intelligence gathering aircraft. Radiation Intelligence aircraft converted from Yak-28L by fitting RR8311-100 air sampling pods, with no other specialist equipment. Un-armed electronic countermeasures aircraft with an extensive EW(electronic warfare) suite in the bomb bay and various aerials and dielectric panels for transmitting the jamming signals, Excess heat generated by the jamming equipment was dissipated by heat exchangers under the centre fuselage. A vertical take-off and landing project, with two R-27AF-300 lift/cruise engines and four R39P-300 lift engines in the forward fuselage. Light attack aircraft project competing with the Ilyushin Il-102 and Sukhoi T-8, eliminated at an early stage. A dedicated long-range interceptor version, the Yak-28P was developed from 1960. It omitted the internal weapons bay in favor of additional fuselage tanks (its fuel capacity was considerable, limited by weight rather than volume), and added a new 'Oriol-D' interception radar compatible with the R-98 (AA-3 'Anab') air-to-air missile. Late production "upgraded" Yak-28Ps had a longer radome of pure conical shape and enhanced armament. Upgraded Yak-28P with R11AF3-300 engines, flight testing started in 1963 but development abandoned when the R11AF3-300 did not enter production.The remotorized "PM" modification has established a speed record of 2400 km/h in 1963. Rocket boosted high altitude interceptor prototype. Extensively re-designed Yak-28P with Tumansky R-11F2-300 engines moved to the rear fuselage with intakes extending to the cockpit, intended to compete with the Sukhoi Su-15. Performance was very disappointing, being slower than the Yak-28P, and serious aileron reversal issues caused the abandonment of the Yak-28-64. Ukrainian Air Force operated 35 aircraft.